Among iOS 10's shiny new toys is a messaging feature that allows you to add effects to your message bubbles, send full-screen animations with your messages, add handwritten notes and more. Apple pushes those capabilities with a pretty new spot from TBWA\Media Arts Lab that focuses on one full-screen animation in particular. 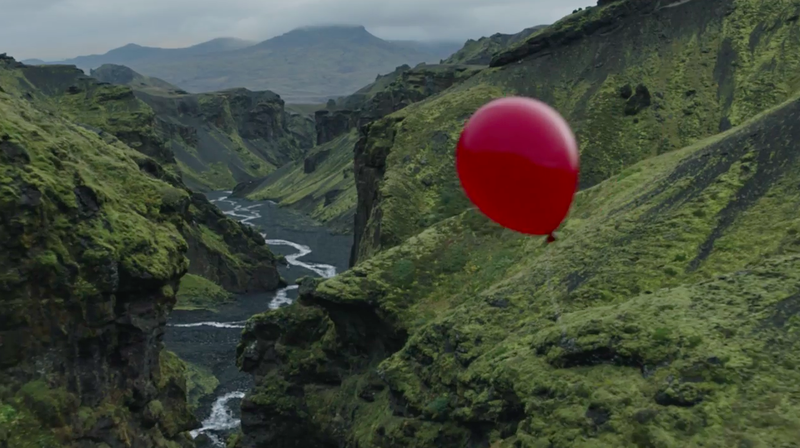 The 60-second spot starts with a single red balloon floating out the window of a remote house and starting a journey though various gorgeous landscapes—with the red really popping against the green, blue and grey backgrounds of forests, oceans and cities. Eventually the balloon finds a friend, then more friends, and they make their way into another house—completing the physical journey that's taken milliseconds to complete from one iPhone to another. The spot continues the "Practically Magic" line that Apple has been using on all of its ads for the iPhone 7. And indeed, the added flashes of color and animation in messages do feel, if maybe not quite magical, certainly more fundamentally joy-producing (if also more minor and fleeting) than the other features advertised so far—the phone's water resistance and its better camera for shooting in low light. There's also a bit of Sony Bravia's famous "Balls" spot in here—though the Apple ad is more emotional, thanks in part to the use of "I Will Follow You" by Toulouse (a brand new remake of the 1963 Ricky Nelson song) on the soundtrack. To learn how to use expressive messaging in iOS 10, go here.